It is a ride located in the historic center of the city, is located between Plaza de Catalunya and the old port. A set of flower stalls, press, birds and pets along with a number of cafes, shops and restaurants make this a favorite place for tourists. This ride usually installed craft markets and there is usually painters and artists who offer their works of art. Walking along the Ramblas you can see the Palace Virreina, the Gran Teatre del Liceu, La Boqueria market and the port where this walk ends at the statue of Christopher Columbus pointing which provides the sea. Located on the beachfront of the Rambla number 99, is a monument of the Baroque period that highlight the balconies and terrace seen on the facade. Today it is used for the display of photographs and it is a place you can not miss people who like modern art. The palace is accessible from the metro Catalunya or Liceu. Price varies according to selected exposures and that are currently displayed. Market located on the beachfront of the Rambla where you can find lots of products such as fruits, fish, meats, chocolates and dietary products among others. Theatre located on the beachfront of the Rambla by the great artists who have spent many years and singers. From a street off Paseo de la Rambla leads to the Plaza Real is located in the Gothic Quarter. This place is very lively because there are many bars and dance clubs as popularly called "The Pipe". In the center of the square is the fountain of the Three Graces surrounded by lampposts designed by Gaudí and royal palms high. Besides Spanish courses in Barcelona Linguaschools have an extensive cultural program. Some of the activities of this program are offered for free, others require a small contribute from the attending students, but you will have the possibility to be in contact with other students, enjoy the Spanish culture and visit lots of amazing places of Barcelona. In the neighborhood of Barceloneta by the river Llobregat this port stands which hosts a large number of cruise axial as yachts, private yachts, ferries and pleasure boats. This port contains this many ships because of the good facilities it has, about 20 km from docks and berths. This place is a leisure center with restaurants, shops, an aquarium that displays marine animals of the Mediterranean Sea and an IMAX theater to watch movies in three dimensions. Reached by metro line 3 and get off at the stop "Drassanes" or on the bus lines 14, 59, 57, 91 or 157. This museum is located in the seaport city, houses a collection of objects that show the history of the Sea of ​​Catalonia and Spain in general. The exhibition is a former fighter galley. It is located on Avenida de les Drassanes s / n, can be used to reach the metro station or network Drassanes city buses. Museum hours are Monday to Sunday from 10:00 to 20:00, the ticket office closes one hour before the museum closes. The ticket price is 6.50 euros and 5.20 euros reduced costs in the price of admission includes an audio guide is available in several languages ​​to monitor the visit. Other combined tickets that include other exposures. Seat of the Archbishop of Barcelona, ​​Santa Eulalia Cathedral is Gothic and was built between the thirteenth and fifteenth on the ruins of a cathedral of the Roman times. Santa Eulalia and Santa Cruz are the patterns of this cathedral. On the facade of the cathedral's many gargoyles representing fantastic animals being the most popular one that has the shape of an elephant. One of the main halls of the cathedral is the chapel of Santa Lucia is located in a part of the faculty and is vented to the outside. Also is the crypt of Santa Eulalia where the remains of the saint who was martyred and thus built this monument. Gothic style church located in the Ribera district, dating back to 1329 and its creators were Ramon Berenguer Despuig and Montagut. Horizontal lines and high walls without too many windows are the main components of this church. Ildefonso Falcones's book "The Cathedral of the Sea" is based on this cathedral and it is visited by many tourists. Plaza that houses the buildings of the City of Barcelona and the Generalitat of Catalonia and it is the place where you cook all political movements in the city. Daily cleaning of Catalan beaches, blue flag shows that are approved by the European Union and has good facilities including showers, changing rooms, sun beds, beach bars and surveillance stations and Red Cross made from Barcelona beaches some of the best in Spain. It is a beach with good facilities and bicycle parking, showers, toilets, sun loungers and parasols, golden sand is great affluence and public including the inhabitants of the city. It is located southwest of Barcelona in the district of Ciutat Vella. Its 1100 meters long home to various sports clubs that offer a variety of maritime activities. An area of ​​reduced mobility facilitates entry and exit from the beach and water to the disabled. It comes through the line 4 station called Barcelona or through the network of buses in that area as 14, 16, 40, 39, 45, 51, 57, 59, 64 or 157. One of the largest beaches (1,100 meters long) and Barcelona's oldest beach of Barceloneta. It attracts many foreign tourists and groups of students from area schools. It has very good facilities such as bicycle and car parking, public restrooms and showers. This beach has different places for leisure and children's areas, areas for skateboards, a beach volleyball court, table tennis and even a Bilbioplatja which is a library for users of this beach. Besides all this there is also the so-called Centre of Platja offered to perform various activities especially in summer. It is accessible from the metro station called Barceloneta located on line 4 or via the bus network that we can choose between 17, 36, 16, 39, 57, 45 and 59. It is a beach with dimensions slightly smaller (400 meters long) which means peace of mind and ideal to spend the whole day by the sea due to the different amenities that is the playground, two volleyball courts beach and a ping-pong. People with disabilities can enjoy a dedicated area for them with facilities in and out of the water (a water chair available). This beach is accessed via the metro station called Ciutadella-Vila Olympic or via the bus network among which we can choose between 6, 41, 36, 141 and 92. Playa which measures 640 meters long and recently (in 1992) was reformed. The safety and leisure are the key points of this beach because it has two ping-pong tables one treads beach volleyball facilities as well as public restrooms, showers and rental of chairs and umbrellas. Playa used by people with an age a little higher than the other (there is an average of 37 or 38 years) and most of them do not live in the city. Enabling a bike path on the beach makes it easy to access to the beach in this vehicle. There is also a car park located in the coastal strip number 34. To get to this beach get off at Poble Nou Metro Station Line 4 or using the bus network among which you can choose from 6, 36, 141, 41 and 92. Beach located in the district of Sant Martí and trained with the reforms to the 1992 Olympic Games. This beach is not very large as it measures only 500 meters long, some of which are used as spaces naturists. The children's play areas, volleyball, skateboarding, basketball, the ping-pong tables and library available in the months of July and August make this beach a place of leisure. A beach area is dedicated to water sports and has a bike path that provides access to bike. The vehicle parking on the street is Fària Garcia 1 and is accessible by public transport metro station called Selva de Mar from line 4 or with bus among which are 71, 36 and 141. Last Hotels.com guest beach located further east of the city, has 500 meters long widely used especially by the female gender. The amendment made to the 1992 Olympics that make this beach is a place with amenities and facilities for people with disabilities as they have gateways, use the lift and a water chair that facilitate the entry and exit of water to these people . Through the subway station on line 4 Selva de Mar and bus lines 36, 141 and 43 can access this beach. You can park your car in the same parking him on the beach of Mar Bella. It is located in the southeast of the city, near the port and the old town. The hill of the Jews is as its name translates today is closely linked with the sport because of the great facilities that are located there, and that hosted the Olympic Games in 1992. This mountain is also the Palau Sant Jordi is a covered pavilion that hosts numerous sporting events like concerts and shows. The streets, squares, restaurants and entertainment venues make this place one of the Catalan city tour called the Poble Espanyol, bringing together the main features of many Spanish towns, entry to the exhibition highlights is a reproduction of the walls of Ávila. This mountain is also a large park and a cemetery that bear the same name as the mountain. Located in the city center and has long been the only green area. It was built imitating the Luxembourg park located in Paris and was made in the land that the fort was located in the city, inside the park is the Barcelona Zoo where you can see one of the most important collections of Europe divided animals into mammals, birds, amphibians, reptiles and urban species. This zoo was the residence of the albino gorilla Snowflake. Within the park also provides a lot of gardens that include exotic plants and in the center is Lake decorated by a waterfall. A rowing small boats can be rented for a walk around the lake. The parliament of Catalonia is located in this park. Located in the district of Horta-Guinardó, is one of the oldest parks and is a fun place for children and the elderly because their trees are a great labyrinth, a good place to play hide and seek with the little ones. Besides this maze the park has three terraces, one with a pond that receives water from the nymph Egeria. This park was the setting for the film director Tom Tykwer's Perfume. In the Serra de Collserola is this peak that is the highest in the area and from where you can see magnificent views of Barcelona while strolling through the natural spaces that mountain. This saw is the Church of Cor Sagrat reminiscent of the Parisian church called Sacre Coeur because of where it is located and its design. From the Torre de Collserola is a telecommunications antenna can see the best views as it is situated at 268 meters high. As entertainment area here is the Tibidabo Amusement Park is the first to be made in Spain although they have made many improvements and has been updated over time, today has a 4D theater that has effects Light, air and water along with the 3D glasses you fully immersed in the movie. This mountain hotel is located on Florida a good place to stay. This temple popularly known as La Sagrada Familia was designed by Antoni Gaudí in 1882, is currently an unfinished work that follows the construction. The cone-shaped towers completed in peak found on the websites was one of the most original ideas of the artist. Inside can be seen leaning columns and domes shaped hyperbolas and parabolas. The project was continued from planes that are preserved and from a plaster model that made the designer which in life could only make the Nativity façade and the crypt which is a World Heritage Site today and was a of the candidate proposed for the seven wonders of the world. Visiting hours are from 9:00 to 18:00 in the winter months (October through March) and from 9:00 to 20:00 in the summer months (April to September), The ticket price is 8 & euro. It is located in the metro station called Sagrada Familia which corresponds with line 2 and line 5. You are perfectly entitled to access to the disabled. Park declared World Heritage Site consists of different types of architectural elements designed by Gaudí and is an example of Catalan Modernism. It is open every day of the year and is reached from the subway station Vallcarca that is a bit far but have built an escalator. In the design of the sculptures combine different forms with colored mosaics made of glass and ceramics. Among the most characteristic monument are the staircase leading to the central square next to him has a colorful salamander, the large plaza with more than 3000 square meters, the viaducts, Calvary and patrons. Work of Catalan modernist precursor Antonio Gaudi, is located on the Paseo de Graia number 43. It is a very original that combines different forms and details on the facade and in the interior of the house. The balconies on the façade are composed of interlocking curves of them made with ceramic reaching the roof which also forms a curve that looks like the back of an animal that has a fireplace and oddly placed what it calls the attention of tourists. Visiting hours are from 9:00 to 20:00 from Monday to Sunday, only closed on December 25th and January 1st. The ticket price is 16,50 euros each person and includes an audio guide that will show the details of the visit. This audio guide is available in seven different languages ​​and the entire visit lasts about an hour. During the visit will be accessible to the main floor where the family resided Battlló (if you only want to visit this room admission is 11 euros, with half-hour audio guide included) and also be able to visit the Attic and Roof ( to visit these rooms will be charged the full ticket price). Another Gaudi's modernist work, started in 1906 and its construction lasted 4 years and was commissioned by Roser Segimon marriage and Pere Mila. 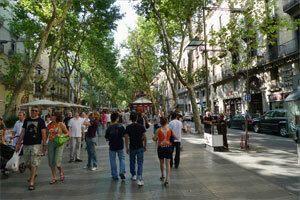 It is located on Paseo de Gracia number 92 in the Eixample district. Its construction is made of natural stone and like all works of Gaudí forming curves. The roof is covered with white tiles along with the rest of the facade gives the impression that it is a snowy mountain. The balconies on the facade consist arranged as wrought iron vines. In 1984 it was declared a World Heritage Site by UNESCO and Caixa Catalunya today is the owner and responsible for carrying out the restoration and preservation of the building for the public to visit if only be visited the fourth floor, the attic and the terrace and the rest are offices and even homes of some families. This museum comprises more than 3,800 works in its permanent collection increasing this number when offered temporary exhibitions. It consists of five buildings are palaces dating from the thirteenth and fourteenth sigils and have been renovated throughout its history. Opening hours are Tuesday to Sunday from 10:00 to 20:00 hours. The ticket price is 9 euros and includes the temporary exhibition available at that time or if you choose only see this exhibition admission is 5.80 euros free admission being under 16 years and those over 65 years. There are three open days: February 10, May 18 and September 24. You can reach the museum by subway stations Jaume I (line 4), Arc de Triomf (Line 1) and Liceu (line 3). Buses also make a stop at this museum (17, 40, 45, 39, 51, 14, 59, 19 or 120). There is also good access by bike lanes and bike-enabled drive can also be accessed though the museum does not have parking. Other museums in the city include the National Museum of Catalan Art with a major exhibition of Romanesque art, the Museum of Contemporary Art in Barcelona, ​​FC Barcelona Museum located in the Camp Nou and the Bullfighting Museum of Barcelona where they are exposed bullfighters costumes and heads of famous bulls.